Candy corn is one of the most polarizing treats in existence. Want proof? You were either intrigued or repulsed after just reading the title of this post. There’s no middle ground. Sides taken, let the candy war begin. Nowadays every treat has variations, flavors and holiday versions. From Mint Oreos to Caramel Irish Creme to Crystal Pepsi. Everyone likes to try out a twist on the original. That brings us here. You had me at “Artificially Flavored Flavor Creme”. 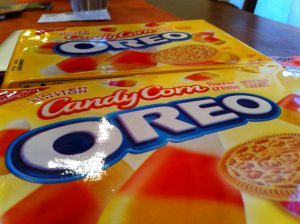 Intrigued by this new abomination, and firmly in the “candy corn good” camp, I decided to conduct an experiment. Gather friends, coworkers, candy and an audio recorder. 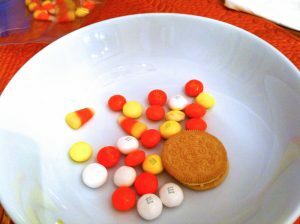 Compare the candies labeling themselves as candy corn flavored with the real deal. Simple. The crowd was evenly divided among the lovers/haters of the original candy. That’s not just good luck, that’s good science. 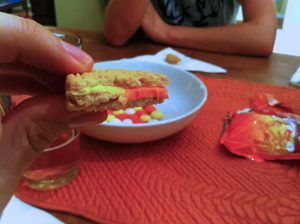 In addition to the Oreos, we also procured some M&M “candy corn” candies for testing purposes. And because there were brightly colored and we’re easily distracted. Everyone ate a few pieces of the original candy corn (Brachs) to remind themselves what it is supposed to taste like. Well, the colors are right. I’m convinced. Everyone takes a big whiff before they get a nibble. Would it taste like it smelled? Was this all a big mistake? Let’s find out. There were a few outliers, but the overall trend was negative. Smells like cake batter. Tastes like a sickly sweet icing crammed between cookies. Not even the m&m character is happy to be on the bag. Admittedly, these are very clearly marked as “white chocolate” on the bag. Still, the coloring and “candy corn” prominently displayed hint at a flavor being present. The verdict? No one seems able to competently match the flavor of candy corn in their own products. “Thank god!” I hear you scream. But why? Is it the texture? 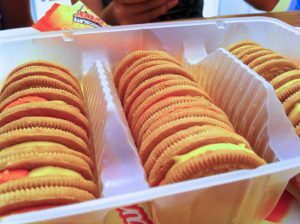 The Oreo had the texture of Oreo filling, not a piece of candy corn. 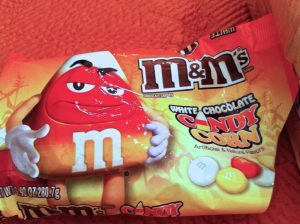 The M&M was a hard candy shell with the white chocolate in the center. Nothing at all like the waxiness of candy corn. And flavor? Well, what does candy corn actually taste like? Is it just sweetness? A mixture of all the sweeteners (there are like 5 on the ingredients list)? What gives it that certain something? I’m not sure why they put “honey” in quotes. Was it fake honey? Is it honey with a capital H like krab with a K? Do they blend up our past loves, soylent green style to serve to us every Halloween? Yes, yes they do. I’d like to thank and apologize to all my friends and coworkers who I put thru this taste test experiment. I assaulted your tastebuds with the best of intentions. I got a cavity reading this post. And then I ate a heath bar to clean my palate.